Marina is a professional dancer, choreographer and instructor, originally from Estonia. 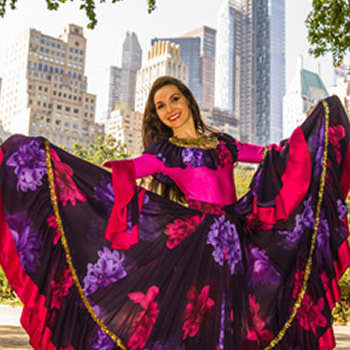 Marina specializes in Flamenco, Romany (Gypsy) dances, Latin, Russian and Eastern European Folk dances. She has performed in many countries, such as Russia, Estonia, Spain, Finland, Canada, and the U.S. Since moving to the US Marina has taught and performed with the Carolinas Latin Dance Company, Charlotte Salsa Dance Company, participated with Argentinean Tango Society, created choreographies and performed in Dances of India annual productions and Opera Carolina “La Vida Breve” and “Aleko” operas.